Building onto Book 1 of the Abuse & Energy  Series, in Book 2 Mariane E. Weigley takes the reader further into her compelling journey from Abuse to Energy. The story continues by having the reader take the deep dive with Mariane Weigley to release old, unprocessed grieving that remained primarily from the death of her father when she was 16. Once released, the road to empowerment begins. Seeing life and the world from a new perspective can allow the awareness and create the opportunity to change from the inside. The book explains what counseling is like, the benefits of having a good counselor, the physical changes that can happen when energy shifting occurs, the benefits of journaling and meditation and how to start both, and why it is important to tell the secrets stored up inside. Just as in Book 1, there are many thought provoking stories, this time about release. This book advances the premise that we are energy It shares the very personal life stories of emotional abuse and release of old, built-up energy, allowing the reader to apply concepts bringing a greater understanding of their own lives.   How the role of releasing old, built-up energy can change your life.   Ways we release energy and why it is important to do so.   Why it's important to trust your intuition.   How the Process of Energetic Change works.   Why energy can be the problem and also the solution.   Why it is important to develop your voice and tell your secrets. 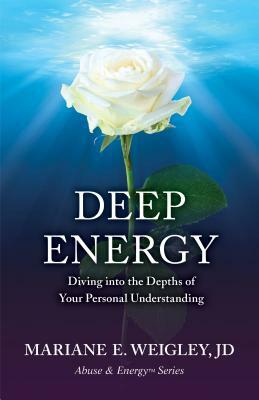 All three books in the Abuse & Energy  Series are part of the larger subject of Understanding Yourself as Energy. They are also part of the Rise of the Individual. Within the three books in the Series, Mariane E. Weigley uses her personal story to support why she is qualified to give others the Information, Validation, and Support (I.V.S.) she does. Her teachings, both writing and speaking, offer hope for one's soul. They share her journey through narrative and individual stories]]but also have "call out" sections for the reader to understand the learning of that section and its application to their own lives. So, it is a SELF-HELP with the story of the real journey of the author. Her work as an attorney and now as a speaker on these issues bring the credibility and value to readers, wherever they are on their own journey.